According to Glyn High-Tech Distribution , consumers are demanding realistic video, 3-D graphics and photo-realistic images in the office and in the home. Solutions exist today to move this high-speed digital data both on short and long distances such as on a printed circuit board (PCB) and across fibre or satellite networks. Moving the high-speed digital data from board-to-board or box-to-box requires a high-performance solution that consumes minimum power, generates less noise (must meet stringent FCC/CISPR EMI requirements), is immune to noise and is inexpensive. LVDS which stands for Low Voltage Differential Signalling addresses this need. It is a way to communicate data using a low voltage swing (about 350mV) differentially over two PCB traces or a balanced cable. LVDS is a low swing, differential signalling technology, which allows single channel data transmission at hundreds or even thousands of Megabits per second (Mbps). Its low swing and current-mode driver outputs create low noise and provide low power consumption across frequency. URT have introduced the new 7” TFT LCD displays with LVDS interface and with 800xRGBx480 dots resolution, 262K colour depth, and touch panel interface. 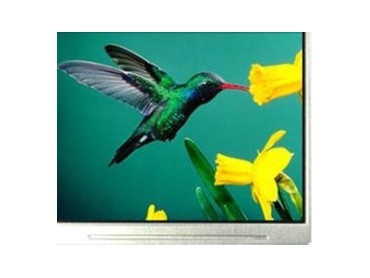 These LCD displays are available from Glyn High-Tech Distribution. Module size (W x H x T) is 163.9 x 103.95 x 9.35 mm while viewing area is 155.2 x 94.24 mm. The 7” TFT LCD displays have transmissive LCD type, LED backlight, built-in timing controller, and DC/DC converter. To interface the 7” TFT LCD display with analogue video (NTSC/PAL/SECAM with Composite or S-Video interface) or PC VGA signals, users can use the URT A/D Driver Board TMS-9083.